The Jeep Grand Cherokee is one of the longest running nameplates in Jeep’s history. After a ten year run as the Cherokee, Jeep made the decision in 1993 to up their game with the introduction of the Grand Cherokee model. When Ford introduced the Explorer to the automotive market in 1991, Jeep wanted an off-road capable SUV, that was luxurious with a smooth highway ride. The Grand Cherokee was introduced to the American public in 1993 as a direct competitor of the Explorer, and has been a popular choice among SUV drivers ever since. The Grand Cherokee has always been one of the favorite members of the Jeep family, and with its recent complete redesign, the Grand Cherokee continues to turn heads. In 2011, Jeep set out to create a newfound style, and enhanced quality for it’s Grand Cherokee, and received another facelift for 2014 and 2015 model years. Not only is the 2015 Jeep Grand Cherokee a luxuriously comfortable SUV, it is one that has earned a multitude of awards from various institutions. It is as capable on the road as it is off the road, and offers better fuel efficiency than ever before with the new EcoDiesel engine. Whatever your unique needs are, the 2015 Jeep Grand Cherokee was made to meet them. When it comes right down to it, no other SUV on the market has earned as many awards as the Jeep Grand Cherokee has over its lifetime. Whether having to do with safety, performance, comfort, quality, or cost - no other SUV can stand up to the Grand Cherokee in terms of accolades received. Check out just a sampling of the awards the Grand Cherokee has in it’s trophy case, detailed below. It’s obvious just from these few examples that the Jeep Grand Cherokee is THE only choice when it comes to a high quality SUV. The Grand Cherokee out-wins every competitor vehicle in its class year after year, award after award. Everything about the all-new 2015 Jeep Grand Cherokee exudes comfort and capability. The Grand Cherokee engineers did not miss a beat when they designed the 2015 model, adding more luxury appointments, for a more comfortable interior. This optional upgrade from the premium cloth upholstery offers drivers and passengers the utmost comfort and style. The soft and supple all-natural leather has maximum breathability, keeping you cool in the summer, and warm in the winter. Add to that heated and ventilated seats, and you may never want to leave your Grand Cherokee’s interior cabin. Available 9-inch seatback mounted screens will play your Blu-Ray and DVD discs without a problem. Keep peace of mind with included wireless headphones and wireless remote. Start and stop your engine with the push of a single button. Fumbling for your keys is a thing of the past with this must-have convenience feature. Let no device be left behind with the auxiliary, USB, and SD Card Reader outlet slots in both the front and back of the cabin. A completely customizable 7-inch display acts as your instrument cluster. Using leading-edge TFT technology allows for complete personalization of your vehicle. The Uconnect System features a large 8.4-inch touchscreen display with navigation, SiriusXM Radio, iPod integration, Bluetooth Connectivity with hands-free phone, and Wi-Fi. Regardless of where your Jeep Grand Cherokee adventure leads you, staying connected isn’t a problem. Enjoy a dual-paned sliding glass ceiling on your Grand Cherokee that opens fully with the push of a button. Keep cool with the power sunshade while still enjoying the fresh outdoor air. A rear cargo area featuring 68.3 cubic feet of storage capacity will help you pack whatever you need. There are obviously plenty of things that the 2015 Grand Cherokee offers in terms of comfort, but how does it actually perform? The Grand Cherokee doesn’t have ‘Jeep’ in front of its name for nothing. The 2015 model delivers on everything the Jeep name promises. Engine - Drivers can choose from one of three engine options - the 3.6L Pentastar V6 with 8-speed automatic transmission; the 5.7L V8 engine with 360 horsepower and 390 lb.-ft. of torque has a Best-in-Class 7,400 pound towing capacity; or the 3.0L EcoDiesel V6 that gets up to 30 mpg on the highway, all while maintaining the Best-in-Class towing capacity of 7,400 pounds. Quadra-Trac I: Fully automatic offers continual balance of torque distribution, for year-round traction. Quadra-Trac II: Featuring all-speed traction control, perfect for those rock off-road adventures. Quadra-Drive II: Class-leading capable system with Electronic Limited-Slip Differential transfers 100% of torque to the wheels for year-round traction no matter the conditions. 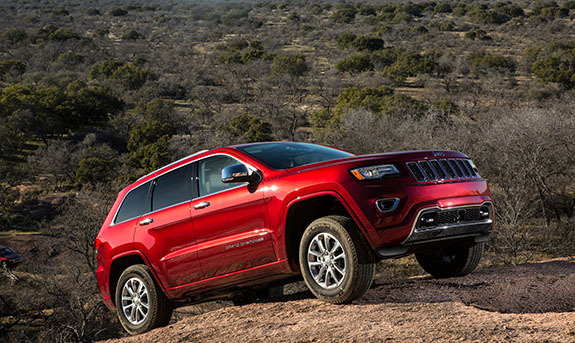 Trail-Rated - Rated for the toughest trails in the world, the off-road capability of the 2015 Grand Cherokee does not disappoint. Tested to perform in traction, ground clearance, maneuverability, articulation, and water fording. The newest member of the Jeep Grand Cherokee family is the brand-new EcoDiesel Grand Cherokee, offering the very best in fuel efficiency. This Grand Cherokee is the best-in-class for fuel efficiency and driving range. The clean-diesel technology with low CO2 emissions help makes this possible. The 3.0L EcoDiesel V6 engine delivers an impressive 240 horsepower and 420 lb-ft of torque. With towing capabilities of 7,400 pounds, this engine does much more than help save the planet. The Grand Cherokee EcoDiesel 8-speed automatic transmission engine gets an impressive 34 highway mpg, and 25 city mpg.